Samsung's Galaxy Note 7 has acquired quite a reputation as a firebug, but it's not the only Samsung device that is being blamed for starting fires. Consumers in the United States and Australia are incensed by blazes that have broken out in their Samsung washers. Soojung of Sacramento, Calif., recounted a recent incident with her Samsung washer in a ConsumerAffairs review: "About seven fire trucks came with two police officers and 21 firemen. It took 50 minutes to extinguish the fire. The fire department says that a faulty part in Samsung washer caused the fire." Soojung complained that Samsung did not respond to her complaints about the fire. In Australia, Samsung has recalled 144,000 washing machines because of a defect that can cause a fire. But some consumers there say the recall has not gone far enough, according to a report in the Daily Telegraph. Samsung did not immediately respond to a request for comment on this story. One Australian homeowner, Phoebe Teitzel, said Samsung had assured her in writing that her machine had been modified before being sold and did not pose a fire hazard. It burst into flames anyway, the 30th such case reported in Australia, according to the newspaper. The "fix" in Australia amounts to using a plastic bag and tape to keep condensation from building up on electrical connections. Earlier this month, Samsung recalled its new Galaxy Note 7 smartphone and said it will replace every device that has been sold since its introduction on August 19. It also suspended sales of the smartphone. The extraordinary moves followed 35 reports of exploding batteries, mostly in Korea. U.S. consumers have so far been stymied in their attempts to identify the cause of the washer problem and to get their machines repaired or replaced. "My two-year-old Samsung washing machine just completely exploded the other day," said Kim of Muscatine, Iowa. "I had the company where I bought the machine from say it is repairable. How can you repair something made of metal that is not even a square anymore -- and even think that it will work properly?" Shari of La Verne, Calif., said Samsung charged her $65 to have a technician come and look at her machine after it caught fire, then refused to replace it. "The technician found that because my unit caught fire and I now needed to replace my motor, motherboard, valves and all the wiring, that it was a complete loss and too much to fix. Then when they submitted the order to Samsung, they denied it," she said. In Tempe, Ariz., Rehta said she had eight years of problems with her Samsung washer, finally ending when the machine caught fire after a service visit. 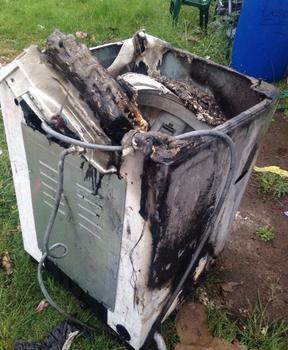 "My experience ended with my washing machine STARTING ON FIRE. I had to unplug it, move it to the middle of a room, smother the fire to keep it from burning down my house." At the service visit just before the fire, Rehta said the technician told her the machine needed $1,200 worth of work but was safe to use. "That was only one load before it started on fire," she said. Consumers who experience safety problems with appliances, furniture, toys or other products should report their experience to the Consumer Product Safety Commission, which can order a recall, using the CPSC's online complaint form. It's also a good idea to post reviews at ConsumerAffairs and other review sites. Hey, stop using your Samsung Galaxy Note 7!